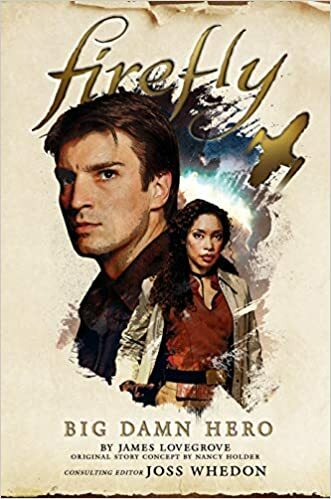 James Lovegrove’s Big Damn Hero is, as mentioned, the first prose novel set in the ‘Verse of Joss Whedon’s Firefly television series. Sure, there have been comic books and graphic novels produced, some of which I own, but those are not my preference. For me, this is the first true adjunct to the Firefly canon, a novel with backstory, inner thoughts, and descriptions that (in my mind) are much fuller and detailed than anything I find in a cartoonist’s frame. There will be three titles in this series from Titan Books, released between now and October 2019. This, the first book, was originally to be penned by Nancy Holder (author of several Buffy novels), but life got in the way and Holder had to step away from the project, turning it over to Lovegrove (author of the Pantheon series, and others). Lovegrove is also the author of the second book, to be released this spring. Short version: if you’re a fan of the show, you’ll enjoy this book, probably a lot. If you’re not a fan of the show but enjoy science fiction, you’ll probably like it as well. It’s a competently told tale in an interesting world, packed with enough complexity, development, and twists to keep you turning the pages. However, neither reader is likely to love this book, and while that’s a shame, it’s certainly not a tragedy. Big Damn Hero does a good job of setting the stage for fans and newcomers alike. I definitely appreciated the details that allowed me to place the story in its proper spot along the Firefly timeline (after the series but before the events of the movie Serenity), and for new readers, it doesn’t overwhelm them with the details of a history that Browncoats know by heart. The main ingredients of the plot are a job, a dust-up, a kidnapping, and a vengeful mob, all told in a style that is true to the “look and feel” of the television show. Thankfully, the book does not go to that place trod by every spin-off game and bit of Firefly merch I’ve ever seen, where every speck of dialogue has that over-the-top, wild-wild-west-ish, howdy-pardner style of ersatz frontier patter. You know, where every gerundial form ends in an apostrophe? Just sayin’, that can get pert-near if not plum annoyin’ if’n you do it too much. Or at all. The prose is straightforward, yet it maintains the unexpected but apropos turns of phrase that Whedon’s original was known for, and which toss a dash of the poetic into otherwise mundane dialogue. We also get some backstory on Mal (Captain Malcolm Reynolds), plus insight into the stories of other characters like Shepherd Book and Inara Serra (who remained ciphers through the show/movie). However, it is not a perfect book, and this is why I did not love it. There are a few scientific gaffes*, some shark-jump-worthy heroics**, and typos that really should have been caught***. My main complaint, though, one that is pretty common with event-driven plot lines, is that it all goes a bit pear-shaped at the end. It’s not that it’s unbelievable (they live on a spaceship, after all), but it did strain my suspension of disbelief. Mostly (and without giving anything away) it was character motivation and resolution that I had difficulty with, but after finishing the tale, I found myself willing to forgive the small bit of crowbar action used to jam a quick resolution into the last chapter, as the rest was just so much fun. Big Damn Hero, aside from really not incorporating the title into its plot, will not win any Pulitzers. Or Nebulas. Or Hugos. But it is a damned fun read, and a quick one to boot. I enjoyed it, especially seeing the gang in action again and learning more about their characters, their history, and their ‘Verse. I recommend this book (with caveats). With winter almost here, it’s a great book to curl up with next to the fire, with a hot toddy at your elbow. *Degaussing removes the magnetism from a ship, but does not remove a hull’s capacity to attract magnets (e.g. magnetic boots). **The old trope of cutting a rope with a bullet or a thrown knife is tired, overused, and beggars belief as used. ***Every book has typos, but “crowed” for “crowd” in the final sequence just popped me out of the story at a crucial moment. Should have been caught.